Known for his satirical dark humor, Voltaire gives love the finger on Boo Hoo: a break up record for lonely hearts with an ax to grind! This isn’t a CD you share with the one you love. This is the CD you send to your ex! Voltaire’s third CD explores the soulfulness of modern music, yet does it within his trademark old world, acoustic gypsy sound. After spending the better part of the last 12 years in a somewhat idyllic relationship, Voltaire suddenly found himself with a one way ticket to Heartbreak Hotel. This led to an album’s worth of material spanning the gamut of emotions of love lost — from bitterness, remorse, sorrow and anger to irreverence, defiance, acceptance and consolation; mixed – of course – with heavy doses of the satirical dark humor Voltaire has become notorious for. The track “BRAINS!” was used on (from The Grim Adventures of Billy and Mandy) and has it’s own wiki page! POP-ROCK. Voltaire désabusé. A l’instar de son illustre homonyme français, l’auteur-compositeur new-yorkais Voltaire manie l’humour avec la dextérité d’un escrimeur. Sur son dernier album, écrit, dit-on, à la suite d’une douloureuse rupture, c’est aux minauderies sentimentales que cet artiste protéiforme, auteur également de bandes-dessinées, s’en est pris. Un disque coloré où, parmi de multiples références, le jeune homme révèle un goût prononcé pour la musique tzigane. Voltaire is just about the only musician I know who has the balls to take a personal situation and make it public. What’s more, he makes fun of it and puts it on his new CD – call it humor as catharsis if you will. By now his break up with his long time partner is no secret to most people. At Projektfest he announced to the entire crowd that it was his first convention as a “single” man – lord forbid. His latest CD, Boo Hoo is described on the Projekt website as “a break up record for lonely hearts with an ax to grind!” and inside the CD sleeve in the credits he writes, “Dedicated to ‘you know who’ with love, hate, bitterness and reconciliation.” So while the songs on this CD are as funny and as witty as you’ve come to expect from Voltaire, I cannot help but wince just slightly knowing that some of it is based in truth. Perhaps he should tour with Funhouse when they come to the U.S. They could call it the “Songs About My Ex” tour and we could all show up for a night of drunken musical therapy. Count me in. A tongue-in-cheek album for all the girls Voltaire has loved before. No, these are not love songs, but hilariously infectious tunes and playful sarcasm with that gothy touch. | 4 stars | Leave it to Voltaire to continue being the ultimate prince of wry darkness – even though the album was indeed inspired by his sadness over the breakup of a relationship, he knows darn well that the best approach isn’t self-pity so much as dry humor. Thus the hilarious cover art: Voltaire as sweater-wearing troubadour on stage, one eye blackened, with broken hearts behind him – not to mention the knowingly silly title of the album itself. 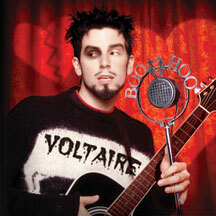 Boo Hoo actually has its share of serious moments, but wisely Voltaire sugars the pill – or perhaps more accurately, puts more medicine in the sugar – with another set of songs at once celebrating and wickedly vivisecting the goth lifestyle. The swirling Eastern European melodies of earlier releases are often replaced by other approaches (check out the ’40s swing kick of “BRAINS!” and “…About a Girl”), but Gregor Kitzis’ violin and Matthew Goeke’s cello add just enough of both elegance and energy to the proceedings.